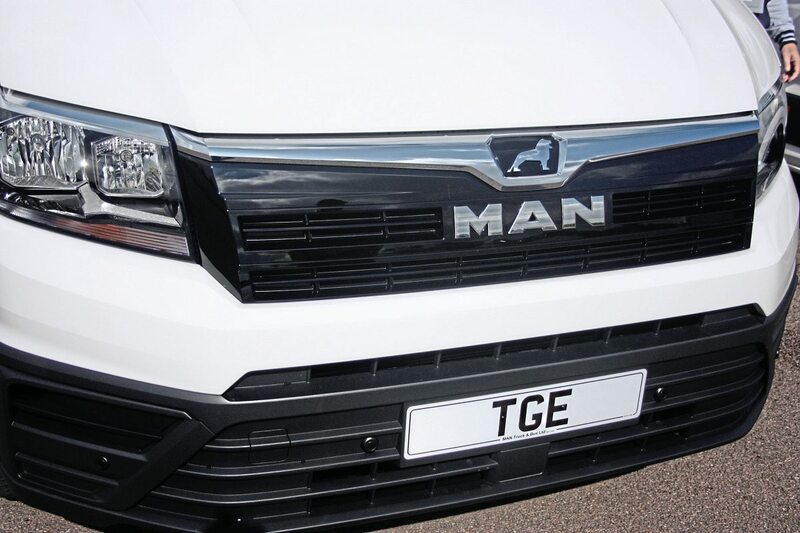 MAN Truck and Bus has become the newest van supplier to the UK market with the launch of the TGE, following its preview at the CV Show earlier this year. 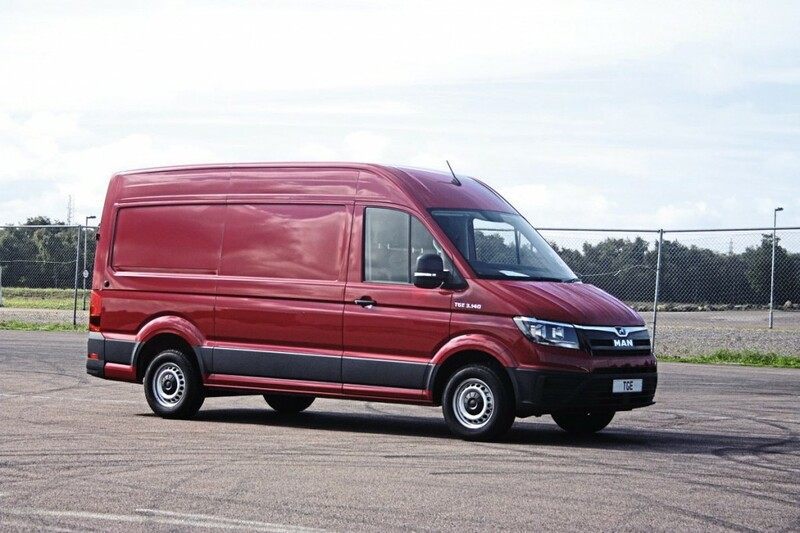 The new TGE is not, technically, a MAN produced product because it is derived from the new VW Crafter which was launched in the UK earlier this year and which is now beginning to be delivered to the market. Eventually the TGE range will extend from 3tonne to 5.5tonne but, as with Crafter, the introduction is being phased and at the moment it is only the 3t to 4t front-wheel drive models that are being launched. To a certain extent, the models of most interest to our market are the 5.5t versions with rear-wheel drive but we will have to be patient, because they are unlikely to appear before mid-year 2018. Indeed VW haven’t launched the Crafter versions of these models yet. So what is available? Vans in three wheelbases and three heights. 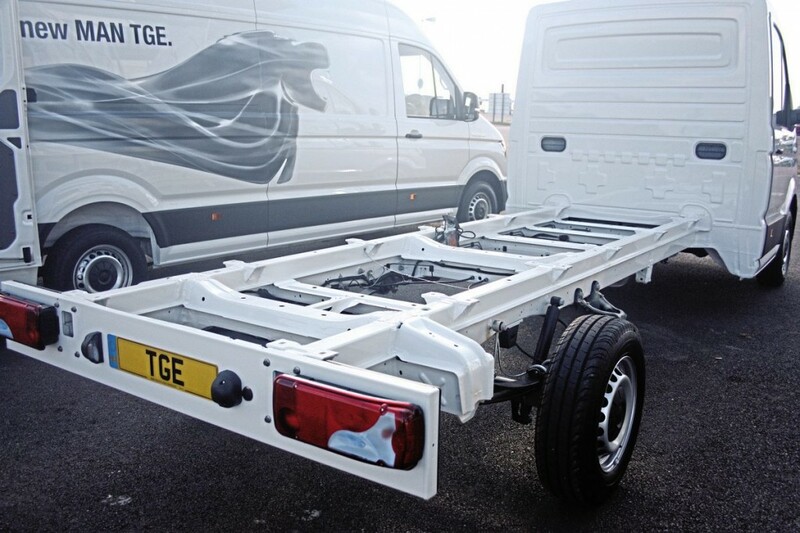 The standard wheelbase vans have a wheelbase of 3640mm and overall length of 5986mm. This model is available with a standard roof height of 2355mm or the high-roof version at 2590mm. The extra-long-wheelbase versions have the same basic dimension as the long-wheelbase models except for overall length, which increases to 7991mm by virtue of an extension behind the rear axle. 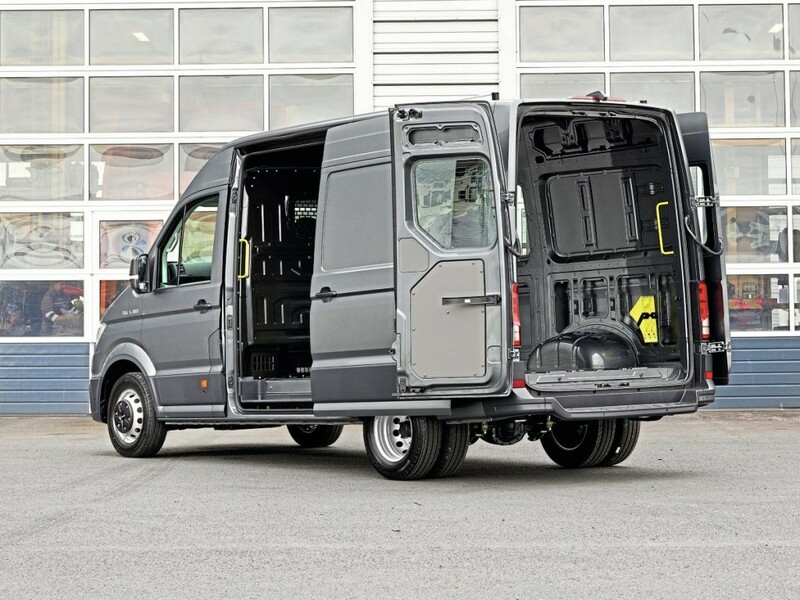 Chassis cab versions are available in all three wheelbases. The 3t models are priced from £23,990 to £29,956 depending on specification and the 3.5 tonners are priced between £26,490 to £36,693. The TGE is powered by the same EA288 TDI four cylinder, direct injection, turbocharged diesel as used in the Crafter. It is actually a development of an Audi engine. The 2.0litre engine is to Euro 6 emission standards using AdBlue. Four power settings are available: 102bhp (75 kW), 122bhp (90kW), 140bhp (103kW) and 177bhp (133kW). These powers are achieved at between 3000 and 3600rpm. The 177bhp engine uses twin turbochargers. Currently the 122bhp version is not available because it is only going to be fitted to rear-wheel drive versions with twin rear tyres. Maximum torque figures are 300Nm (102bhp and 122bhp). 340Nm (140bhp) and 410Nm (1177gnhp) these figures are available across a speed range of 1400 to 2250rpm. The engines are fitted with a stop-start system and also regenerative braking. Two types of transmission are available, six-speed manual or eight-speed fully automatic. Rear suspension uses semi elliptic leaf springs. Max loading is 2.1tonnes. Braking uses discs all round. Standard wheels are 16in x 6.5J rims shod with 205/75 R16 tyres. The fuel tank is 75 litres and the Adblue tank is 18 litres capacity. The vehicles have a 140 Amp alternator and 520Amp (92Amp hr) batteries and the system is 12 Volt. The vehicle incorporates a number of safety systems as standard notably brake assist, electronic stability control, side wind assist and hill start assist. Standard equipment includes; single driver seat and twin passenger seat all with inertia reel three point belts, laminated windsreeen, manual mirrors incorporating wide angle and indicator repeater, media unit with Bluetooth connectivity, 12V and USB sockets, multi-function steering wheel, cup holders, driver airbag, remote central locking and halogen headlights with daytime running lights. The TGE is available in five colours; white, red, blue, green and orange but surprisingly not black. For that or grey or silver you will have to fork out another £1070 for the metallic versions. 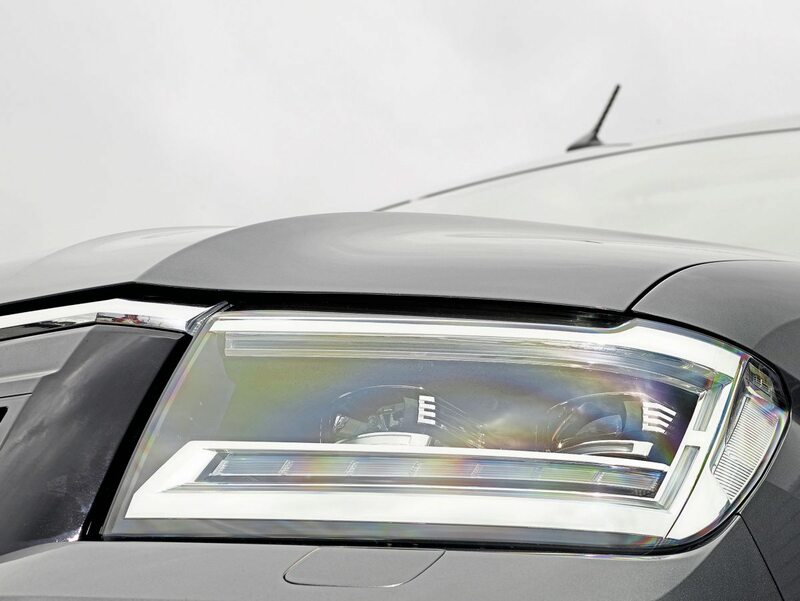 There is a vast list of factory fitted options covering every aspect of the vehicles. 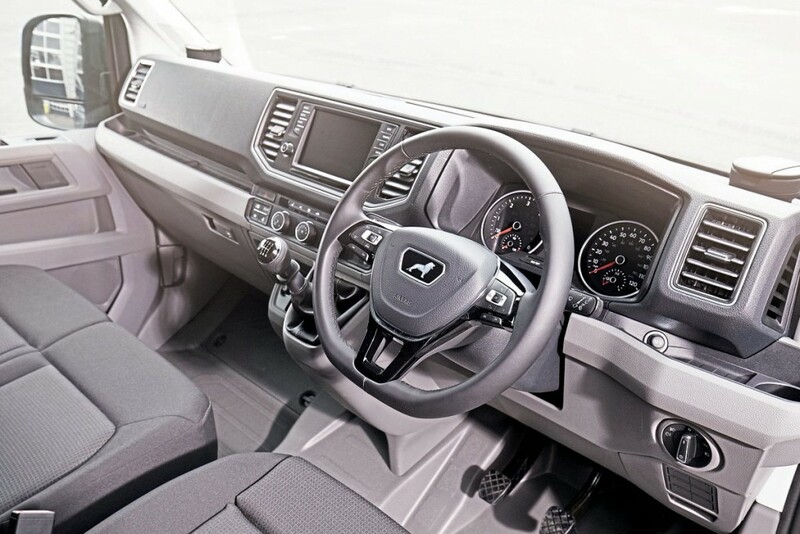 One of the great plus features of the TGE, as it is with the Crafter, is the electro-mechanical steering which enables the vehicles to be supplied with a range of additional safety features, though most are options. These include Lane Assist, Park Assist, Trailer Park Assist, Adaptive Cruise Control, Front Assist emergency braking system, Automatic Post-Collision Braking System and side wind compensation system. In terms of passive safety, too, there is an extensive range of warning systems available for the driver. In addition to front, side and head airbags, these include reversing camera, a parking distance monitor, Rear Traffic Alert, Front Assist (which controls the vehicles’ distance and speed from the vehicle in front and automatically takes action if the driver fails to do so), sensor-based side protection system and Driver Alert which senses tiredness in a driver. In styling terms the TGE, as with the Crafter, is classically simple and heavily derived from the styling of the VW T6 Transporter. This also extends to the cab which again is clean, simple and elegant. The dash is very well laid out with clear instrumentation and all controls exactly where you expect them to be. 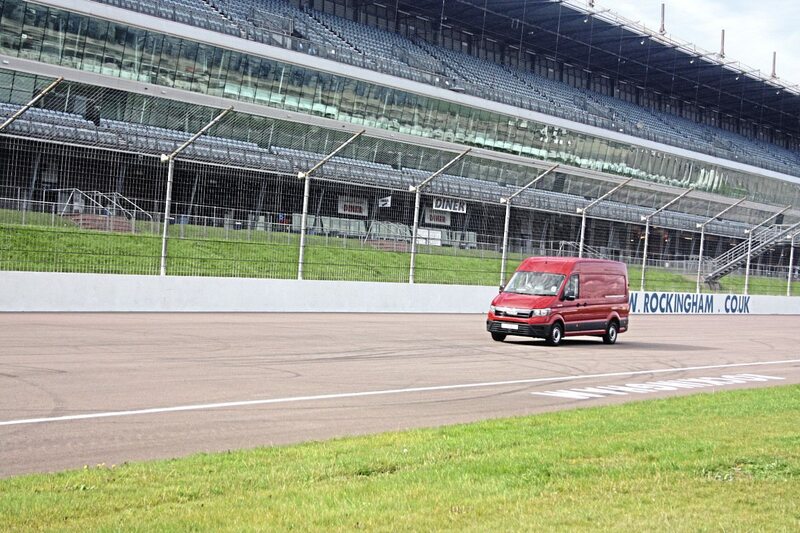 MAN Truck and Bus chose to launch the TGE at the Rockingham Raceway in Northamptonshire, which gave the chance to drive the vehicles at top speed consistently but also by using the track’s inner road system to simulate normal day-to-day driving. As expected, the vehicles perform well, with excellent vision, outstanding roadholding and excellent braking. The engines deliver their power smoothly and very quietly and the massive torque back-up means they are fully on top of the job. Both transmissions are good. The manual is light and positive with well-judged steps and is easy and smooth in operation. The eight-speed fully automatic is also beautifully smooth with well planned steps and almost imperceptible changes. These vans are a useful addition to the range of base vehicles suitable for minibus conversions or coachbuilding. MAN are not playing at entering this sector of the market; their clear intention is to become a major player. They believe that using their very successful truck operation as the basis they will be able to persuade many of those customers who already operate vans as part of their fleet to switch from the van types they currently use to the new TGE. They believe that the ability to offer one-stop support will be a big factor. However, their ambitions don’t end there, they are out to achieve a stake in the market for converted vehicles and specialist vehicles and that includes minibuses and coaches. For that reason they had invited a number of well-known convertors and builders to the event. None of the ones I spoke to had yet had a chance to convert a Crafter although one has just received their first examples. 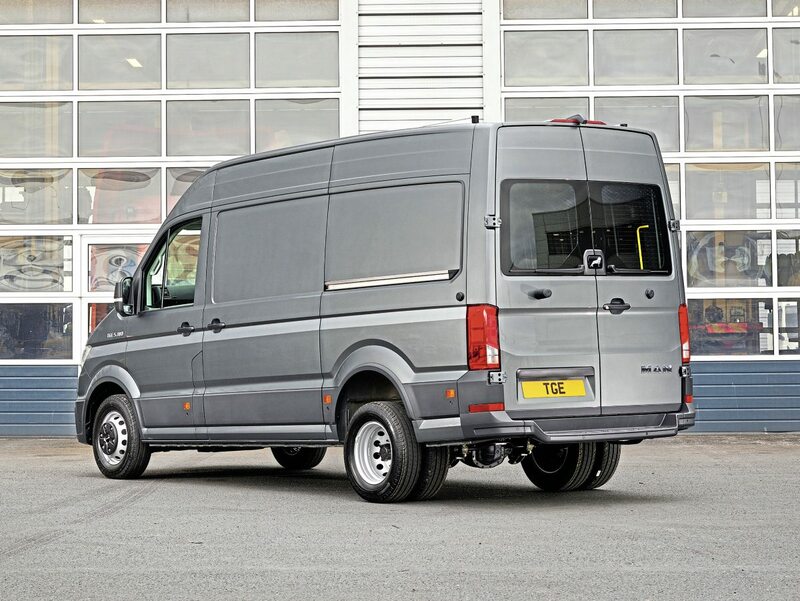 All felt that the Crafter and equally the TGE will prove a very good base for minibuses and coaches especially when the 5.5t options hit the market. MAN believe that with their network of 65 service centres throughout the UK and their reputation for providing quality service will win them business. As Stuart Beeton, the new Head of LCV at MAN Truck and Bus said: “We’re truck and bus people and we know what operators need. We appreciate that vehicles off the road impacts heavily on operators’ businesses and we work hard to minimise those impacts”. From its extensive research of the potential market, MAN knows that one thing that operators – especially those running minibuses and coaches – find irksome with the competition is dealers, most of them heavily car-influenced, who don’t like dealing with buses and coaches and don’t seem able to grasp the need for repairs to be carried out quickly. Dealers that don’t seem to be able to comprehend that these operators don’t have a yard full of spare vehicles. Stuart Beeton claims that TGE customers won’t find that attitude at their dealers. All of them are undergoing a comprehensive training programme on the new models and as they already do with their larger vehicles, and the importance of the bus and coach business and its differing requirements. He says that they will all be up to speed as deliveries begin”. Brave words and if they can deliver, then they will be successful.